Everyone remembers Live Aid, Band Aid and USA for Africa, but the stream of charity singles that followed was frankly quite embarrassing. 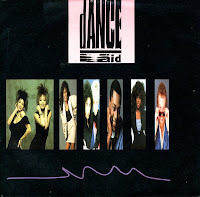 Stock Aitken & Waterman were scraping the barrel in 1987 when they released 'Give give give' by Dance Aid. The proceeds of the single went to Disco Aid, but what that organisation was all about, I can't find out. The interesting thing about this song is that you can't make out who's singing the lines. None of the voices are recognisable, they all blend together into one anonymous blob. Mel & Kim apparently contributed to this song as well - or so the sleeve claims - but I have yet to recognise them. Needless to say, the single flopped everywhere.